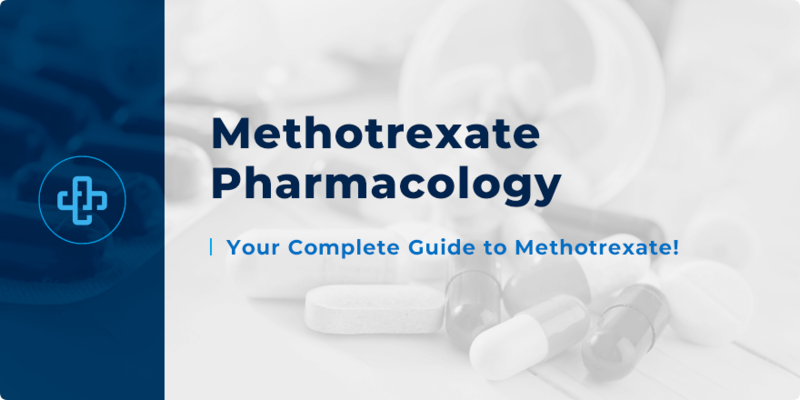 Methotrexate Pharmacology | All the Facts in One Place! Methotrexate is a medicine used to treat a wide variety of indications. First introduced as an anticancer agent in the 1940s, it quickly went on to become a staple drug in the treatment of autoimmune disorders such as psoriasis and rheumatoid arthritis. However, methotrexate use is not without risk. It comes with a whole panoply of common and serious side effects – many of which we explore below. In the meantime, though, let’s take a few minutes to learn more about what methotrexate is used to treat. Let’s take a few minutes to review methotrexate pharmacology; how the drug works to produce its therapeutic effect. Methotrexate works through a variety of means, depending on which indication it is being used to treat. For cancer chemotherapy, methotrexate – or MTX – is used as a folate antagonist. More specifically, MTX works to inhibit dihydrofolate reductase, a necessary enzyme in the production of folic acid-intermediaries that are needed for DNA replication and protein synthesis. MTX is most effective in actively dividing cells, hence its therapeutic advantage in treating cancer. For treating autoimmune disease though, MTX acts through a different means. MTX has both anti-inflammatory and immunosuppressive properties – not least mediated through its inhibition of interleukin-6, interleukin-8 and TNF-α. Methotrexate is associated with a series of common and serious side effects. Methotrexate is also associated with more serious side effects such as hepatic cirrhosis, pulmonary fibrosis and neutropenia. As methotrexate must be taken once weekly, there are often cases of accidental overdose where the patient has taken the medicine daily – a toxic dose that can lead to seizures, coma, renal failure and death. Patients must take folinic acid to reverse the effects of methotrexate overdose. That methotrexate must be taken once weekly. Given the mechanism of MTX, folic acid is typically co-prescribed, though must be taken on a different day than MTX. That methotrexate is teratogenic and so should be avoided in pregnancy. That methotrexate, because it is eliminated renally, is contraindicated in patients with severe renal impairment. That methotrexate should be avoided in patients with hepatic dysfunction. That methotrexate toxicity is more likely if patients take other medicines – such as penicillins or NSAIDS – that reduce its renal excretion. That blood disorders are more likely if MTX is taken alongside other folate antagonists, such as trimethoprim or phenytoin. That the risk of neutropenia is increased if MTX is taken with clozapine. That in cancer chemotherapy, MTX may be administered IV or IM to induce remission until a maintenance dose is warranted. Folinic acid is used to reverse the effects of methotrexate in overdose. Methotrexate is a highly effective drug in the treatment of cancer and autoimmune disorders. However, it also comes with a series of prescribing and adverse effect risks; factors that should always be considered with its use. Want to learn more about methotrexate pharmacology? Register with PharmaFactz today to receive instant access to all the resources you need. In the meantime, though, take a few seconds to join our pharmacy blog newsletter (above) to receive all the latest facts direct to your email!